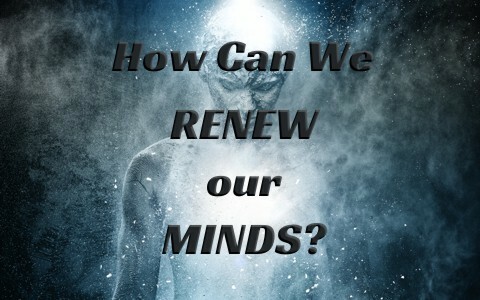 How Can We Renew Our Minds? The Bible commands us to renew our minds, but how can we do that while we are still in the flesh? Before we find out how we can renew our minds, we need to read the admonition from the Apostle Paul who wrote, “I beseech you therefore, brethren, by the mercies of God, that ye present your bodies a living sacrifice, holy, acceptable unto God, which is your reasonable service. And be not conformed to this world: but be ye transformed by the renewing of your mind, that ye may prove what is that good, and acceptable, and perfect, will of God.” (Rom 12:1-2 KJV). I know the Bible teaches we are to die to ourselves and make our lives as a living sacrifice for Christ, but to make ourselves a “living sacrifice” has problems. Like you, I tend to crawl off the altar after making my life a sacrifice for God, so if you are like me, you can make your life a living sacrifice, but you keep crawling off the altar. It’s okay to live that life in church, but in the world? That’s another matter. Even so, that’s the admonition we have. God calls it our “reasonable service,” because you and I “were bought with a price. So glorify God in your body” (1st Cor 6:20) since we are not our own but Christ’s (1st Cor 6:19). The word “conformed” in Romans 12:2 is from the Greek word “syschēmatizō” and is like the word “schematic” or in the form of or fashion of something, but this compound word has two different meanings. Con means “with” and formed means “pressure” so we are not to let the world shape us or form us into the image of itself. In other words, this verse could read, “Don’t let the world squeeze you into its own mold or image.” That’s a command, but it’s not possible without the Holy Spirit, and I believe the very reason the Spirit of God is called the Holy Spirit is because that’s what He does in us. He lives and works to make us holy as we cooperate with Him, knowing we can only do anything through Christ’s strength (Phil 4:13). It’s not easy and it takes time, and is what we could call sanctification. Why do our minds need renewing? For one thing, our minds are by nature corrupt and deceitful (Jer 17:9), and none of us are good in ourselves (Rom 3:10-12), and we don’t even seek after God on our own (Rom 3:11), so this renewal must be an act of the sovereign God…or it doesn’t happen. Dead Lazarus had a better chance at resurrecting himself to life than we do being born again. It is a birth from above, so until we have trusted in Christ and are a child of God, we can’t even have the mind of Christ. The Greek word Paul uses for renewal is “anakainōsis,” and to the Greeks it would mean “a complete renovation” as in one of their dwellings, so the renewal of our minds is God’s Spirit changing our mind in a completely different way. We become new creations in Christ (2nd Cor 5:17) because of the redemptive work of Christ (2nd Cor 5:21). As my family once said, “You’ve been brainwashed,” to which I said, “I needed it….my mind was filthy. I had my mind renewed by God.” They had no idea what I was talking about, but I bet you do. When Paul tells us to “be transformed by the renewal of your mind,” the word for transformed is the same word used in the transfiguration where Jesus and Moses and Elijah were transfigured. The Greek word (“metamorphoō”) means “to change into another form,” so how do we do that? This transformation is all from God because for one thing, we were dead in our sins and didn’t even know it, so it took the quickening (making alive) of God’s Spirit to bring us to life (Eph 2:1-2). Dead corpses cannot revive themselves. They need help. God even grants repentance for those who trust in Christ (2nd Tim 2:25-26), so you can’t be transformed until you have a renewed mind and you can’t have a renewed mind until you’ve been regenerated or born from above (John 3:3-8; 1st Pet 1:3). Just as Jesus and Moses and Elijah were transformed on the mount, so too is the believer, at least in their minds, transformed with a renewed mind by the Spirit of God. Only then can they finally know the things of Christ (1st Cor 2:16), however, you can’t be transformed into something or someone you don’t know about. After a believer has begun to make their life a living sacrifice (Rom 12:1), which is only possible by God’s Spirit, they can be transformed by this renewed by so much that they can discern “what is holy and acceptable to God.” The person that’s been transformed can test whether something is biblical or not by using Scripture, and then discerning whether that teaching is “holy and acceptable to God.” The Spirit of God can reveal where there is truth and where there is error, and even if there’s half a truth, we can see it as a whole lie. This renewed mind can also more easily find the will of God. The will of God is not some cloaked, hidden mystery. God reveals His will in many places in Scripture, like the desire for none to perish apart from faith in Christ (2nd Tim 2:25), that He alone is worthy of glory and none to us (Psalm 115:1), and that we’re to reach the lost with the gospel (Matt 28:18-20). When you read about Jesus’ commands, we know God’s will because the Father and the Son are one in purpose and always agree, so what Jesus commands is also what the Father commands. Elsewhere, even the natural mind can see what God’s will is (1st Thess 4:3-5). Until a person is brought to repentance and the Spirit of God makes them alive, they cannot know the things of Christ, let alone have a renewed mind. It must be the Spirit of God and the Word of God to make the children of God. Empirical evidence is not enough. That only qualifies you to be a demon (James 2:19), so to have a renewed mind, die to yourself on the altar of service to the Lord and don’t be pressured or formed into the shape the world wants you in. Allow the Spirit of God to renew your mind and be transformed by this renewal of your mind, and then you can discern what is true and what is not, and also be able to discern God’s will. When you do that, God may reveal more of His will for your life, and who wouldn’t want that? Similar to what Jesus meant when he said He wouldn’t pour new wine in old wine skin. We need His new wine and new wineskins. Thank you for the encouragement Olu. Next post: Is Torben Sondergaard And The Last Reformation Biblical?